In 2018, the bill passed 33-5 in the Senate and 71-35 in the House, but Gov. Rick Snyder vetoed the draft legislation. Michigan State. Rep. Brandt Iden (R-Kalamazo) re-submitted the Lawful Internet Gaming Act, which legalizes online gambling for the state’s licensed land-based gaming facilities. State Senator Curtis Hertel introduced a companion bill in the Michigan Senate. 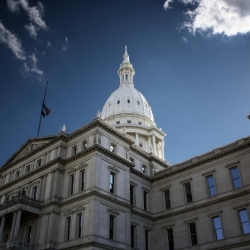 Iden’s bill, referred to as H 4926 in most cases, passed in both houses of the Michigan legislature in December 2018, but was vetoed by departing Gov. Rick Snyder as one of his last acts in office. Rep. Iden said he understood the main reason for the veto was Rick Snyder’s desire to protect lottery revenues. Had the state’s nearly two dozen casinos offered online casino and poker betting, Snyder feared bettors would stay home to gamble instead of buying lottery tickets. Will H 4926 Pass Michigan Legislature? With the new legislative session in full swing, Brandt Iden wants to start the process anew. Gretchen Whitmer taking over as Michigan governor in January, proponents of Michigan online gambling hope Whitmer will sign a new version of the Lawful Internet Gaming Act. Those same proponents wonder if Iden will have the votes to pass H 4926 in 2019. The December votes were 33-5 in favor in the Senate and 71-35 in favor in the House of Representatives. The votes, especially in the Senate, appear to be large enough to sustain a loss of popularity, but many factors have changed in the new year. First, Sen. Mike Kowall is no longer serving the Michigan Senate. Kowall was a stalwart supporter of Brandt Iden’s online gambling bill and a strong backer of Michigan’s gambling industry in general. Since 2016, when a gambling bill was submitted to the Senate, it was Mike Kowall’s name on the bill. Sen. Curtis Hertel took Kowall’s place as a sponsor of the Lawful Internet Gaming Act in the Senate, so proponents can hope Hertel can command anywhere near the 33-5 vote Kowall received in December. An even bigger wild card is the large number of new sitting members in both houses this year. The November midterm election saw a big wipeout for state representatives and state senators, especially on the Republican side of the aisle. Five seats apiece shifted from the GOP to the Democrats once the new legislature convened in January. Brandt Iden has sought bipartisan support for H 4926 over the past 3 years, but he will have less reliable votes from his party when it is time for committee votes and floor votes this year. The 2019 version of the Lawful Internet Gaming Act appears to be quite similar to previous versions. Given the popularity with lawmakers last year, that makes sense. Brandt Iden said that consumer protections have been strengthened in the 2019 bill. Because H 4926 needs to appeal to Democrat lawmakers more than the previous version, beefing up consumer protections is a way to sweeten the deal. Whatever happens with the 2019 version of the Michigan online gambling bill, Brandt Iden now qualifies as a stalwart in championing online gambling in his home state. It would be too much in this small space to recount Iden’s various attempts to pass online gaming legislation since 2016, but the state representative from Kalamazoo has met with several reverses and refused to admit defeat. His near-miss last year is a clear indication Brandt Iden has the legislature on his side, so one can hope Gov. Whitmer is on his side on the issue, too.